A 2-page quiz designed to cover the topics of physical traits, alleles, dominance and recessiveness, Punnett squares, and most importantly incomplete dominance and codominance. This quiz is designed for both middle school and lower high school students. This 20-point assessment involves 6 questions that center around the genetics of squirrels living in a forest. 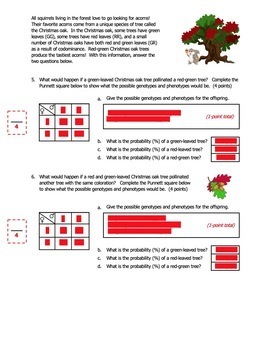 Students are asked to state the possible genotypes of multiple physical traits in squirrels and solve 4 questions covering incomplete dominance and 2 questions covering codominance. Most questions involve using Punnett squares and analyzing the results. 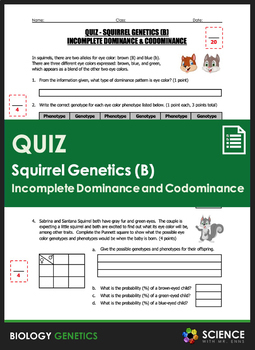 This quiz is designed to assess student understanding following the completion of the worksheet entitled Worksheet - Squirrel Genetics (C) (Incomplete Dominance & Codominance). This product forms part of a larger suite of Squirrel Genetics products. Links to all of the product in the suite are found below. Download the full PDF preview to see EXACTLY what you are getting! 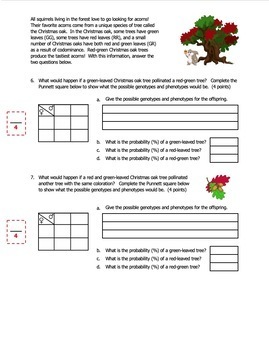 Worksheet - Who Was Gregor Mendel? Worksheet - What are the Forms of Dominance? Worksheet - What is DNA? Worksheet - What is DNA Transcription? Worksheet - What is DNA Translation?